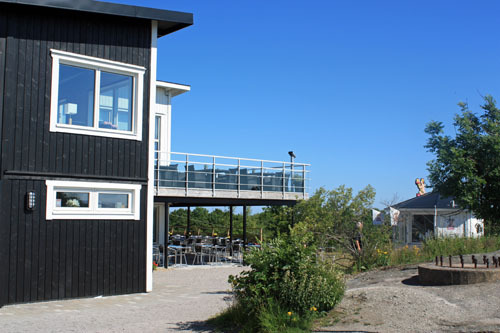 I got a gift card from my mum a while back for an afternoon buffet at a local cafe called Cafe Utkiken - Cafe Lookout here in Karlskrona, Sweden. 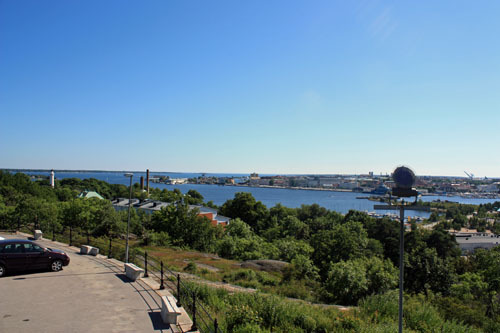 This cafe is located at the highest point in Karlskrona which is called Bryggareberget - Brewer Hill. So of course I grabbed my camera and shot a ton of photos while I was up there. Below are some of them. 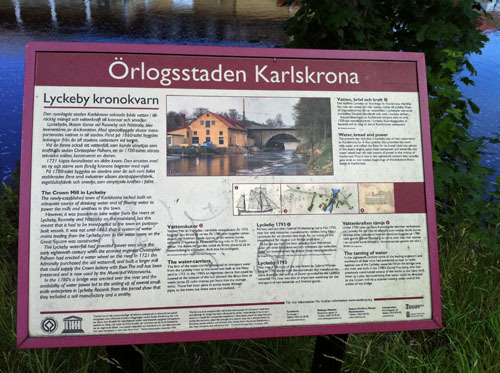 The name of the road up to Bryggareberget is Kärleksstigen - Love Trail. Such a cute name I think, hehe. 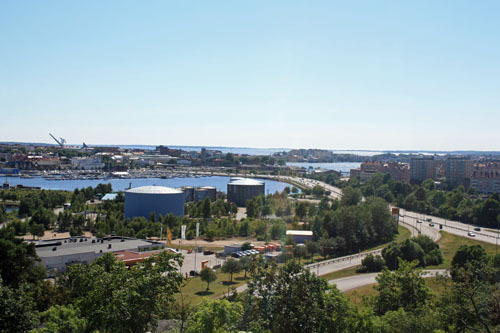 View of Karlskrona from Bryggareberget. The big roof in the photo belongs to the old German Brewery estate. This brewery was founded by the German brewster Philip Kraan in 1693 and was in business until 1972. Today the estate is used for offices. 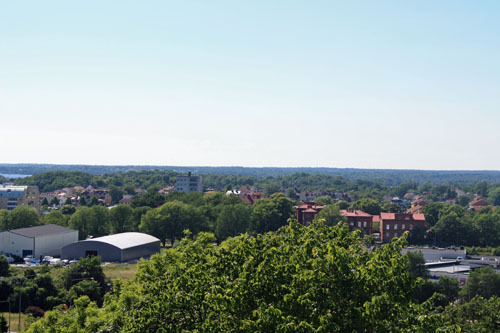 Another view of Karlskrona. 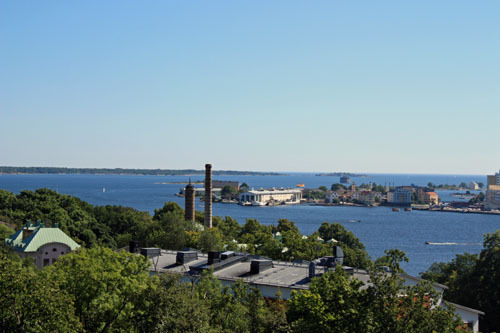 Actually the city of Karlskrona is made out of a bunch of small islands. Straight ahead is Karlskronas main island called Trossö which is where our city centre is. 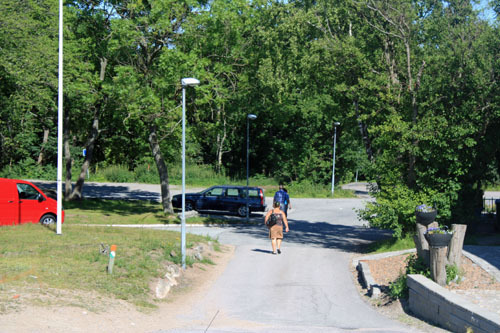 To the right is Karlskronas main road called Österleden which leads into Trossö. 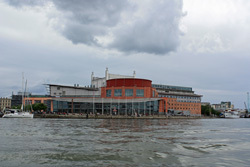 View of the other side of Österleden. Almost looks like I live in a jungle. Lol! 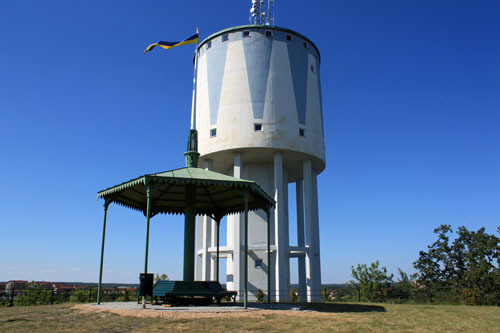 Karlskrona water tower is also located at Bryggareberget. Cafe Utkiken at Bryggareberget. Which is where I had my afternoon buffet. It was very hot outside on this day so we sat downstairs in the shade instead of on the balcony. And this is what my gift card bought me. 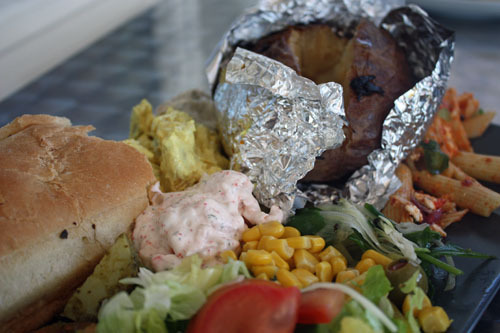 A baked potato, baguette, different fillings, pasta salad and other different salads. Everything tasted alright. 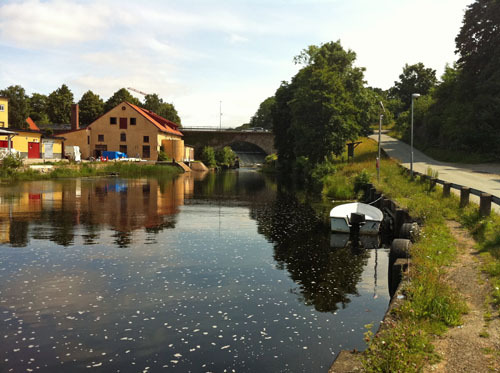 Lyckeby river. 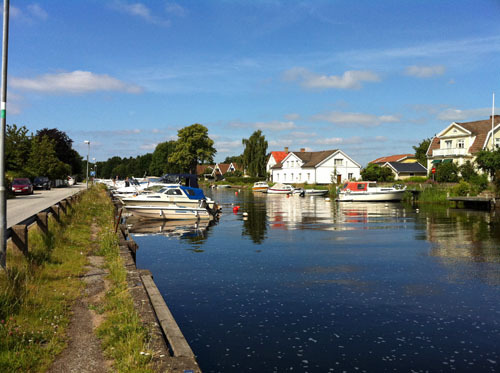 Lyckeby river is a 90 kilometres long river that flows through south-eastern Småland and East Blekinge in Sweden. 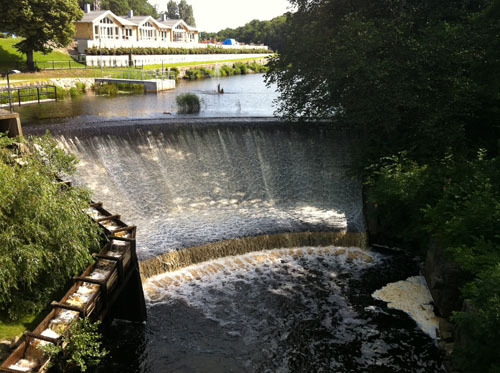 And I pass this river many times around different places in Lyckeby on my walks with Lisen. One of my favourite places to see this river is from this little bridge about 5 minutes from my home. And I love the sound of the waterfall here! I also really enjoy to see the water run through the mill. 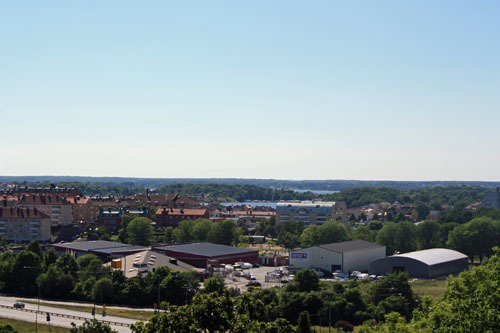 So I recorded this panoramic view video from the bridge with the hopes of making Lyckeby river more vivid to you. 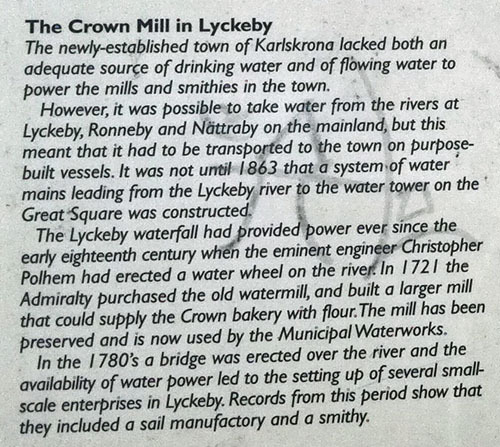 The Crown Mill (orange building) lies next to Lyckeby river. The bridge I recorded the video from is right behind the mill. My weekend in Gothenburg, Sweden - lots of photos! So the first thing I associate with Gothenburg is trams. Much in the same way I associate trams with San Francisco. 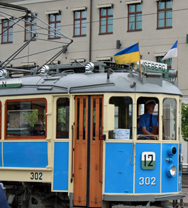 Actually, Gothenburg has the largest tram system in Sweden and trams have been in traffic in Gothenburg since 1879. The carts were pulled by horses until 1902, which is when the first electrical tram was introduced. 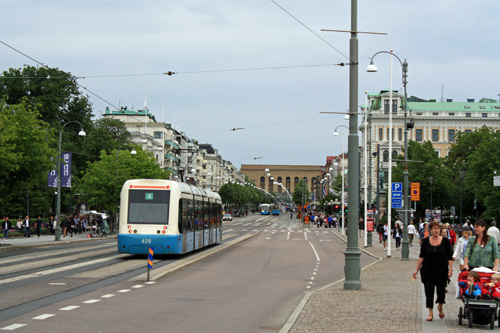 Left pic: tram line number 12, also known as Lisebergslinjen. This is a museum tram line with trams from as early as 1902. 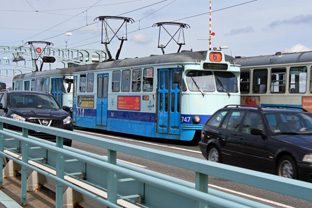 Right pic: some modern trams. Nordstan mall. I didn't do any shopping this weekend because I wanted to focus on sightseeing, but we did park the car in the garage of Scandinavia's largest mall - Nordstan (in the pic). In fact Nordstan mall is also one of Northern Europe's largest malls measured in terms of total area (320 000 m² or 3 444 451 ft²) and number of stores (200). 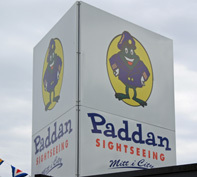 Paddan sightseeing (Paddan - toad in English). On to some proper sightseeing then! 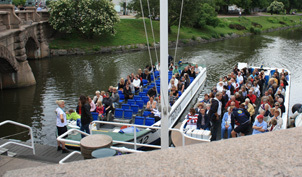 We chose to try the popular Paddan sightseeing boats that run along the river Göta Älv. These boats have been in business ever since 1939. 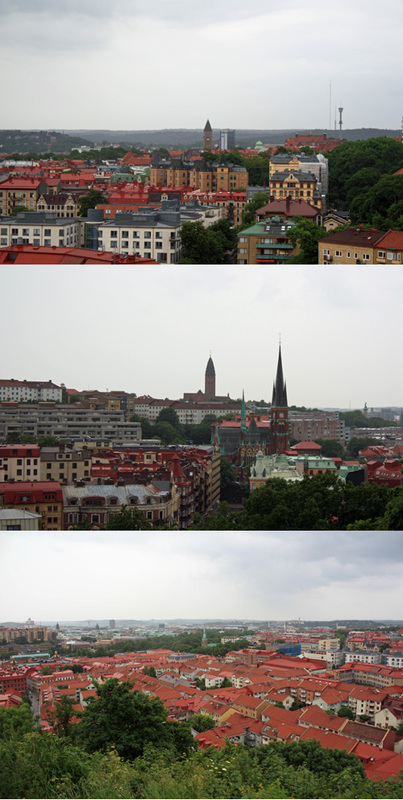 And it was definitely a fun way to learn about and see Gothenburg. Paddan sightseeing tour. 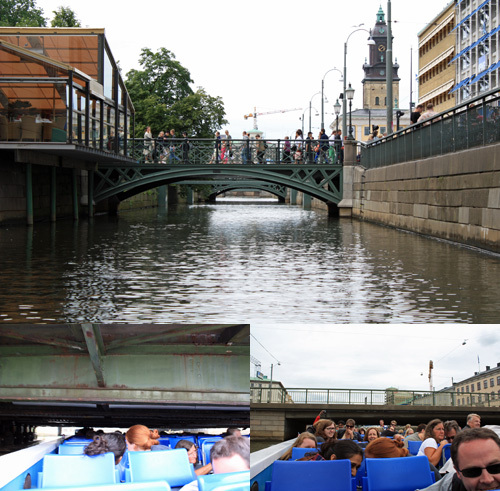 But there are a lot of bridges along Göta Älv, like "The Cheese Slice Bridge" (bottom pics). Where, if the water is high enough (like when we went) you have to get down on the floor and duck so the boat can fit under the bridge. Paddan sightseeing tour. 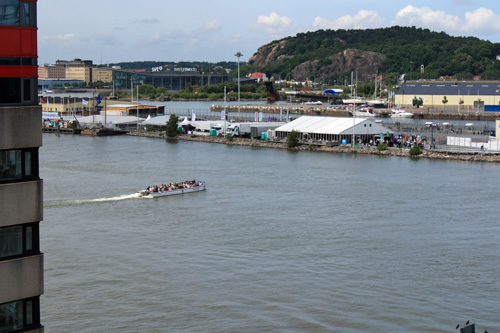 Paddan seen from Göta Älv Bridge. Paddan sightseeing tour. View from Paddan. 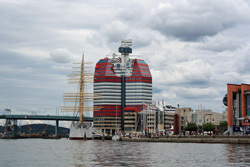 Left pic: Gothenburg Opera House, built in 1994 and shaped as a ship (was the idea anyway). Right pic: The red and white building which locals refer to as "The Lip Stick". Its real name is Skanskaskrapan and it's mainly an office building. 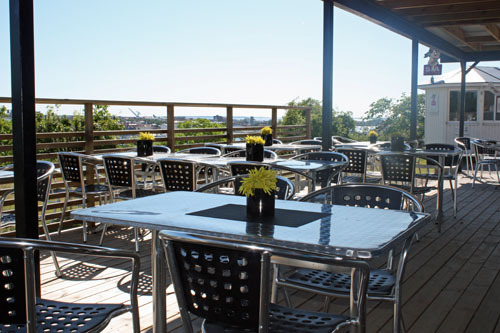 Although a café is located at the top floor where you can have some coffee and enjoy the view. Göteborgshjulet - Wheel of Gothenburg. This Ferris Wheel first opened on May 22, 2010. 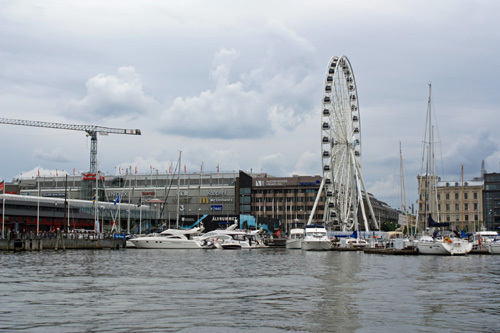 Today it's located at Kanaltorget - Channel square, however it will be moved to the amusement park Liseberg in 2012. 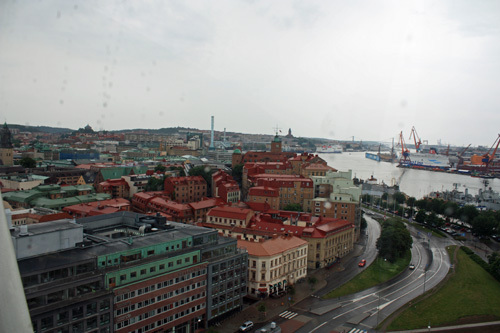 View from Göteborgshjulet - Wheel of Gothenburg. Unfortunately it had started to rain when we went on it and the raindrops on the windows made it hard for me to get any good photos of the view. 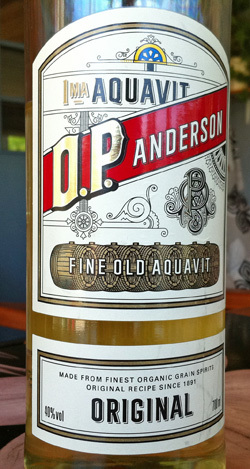 But this is a decent is one. Avenyn. Avenyn is probably the most well known street in Gothenburg. It's packed with shops, restaurants, night clubs and theatres. I had an awesome hamburger along this street at the Italian-American restaurant Joe Farelli's, yum! Gustaf Adolf's square. A popular sightseeing stop indeed. King Gustaf II Adolf founded Gothenburg in 1621. However, the square was originally named Big square. But in 1854, when the statue of King Gustaf II Adolf of Sweden was placed there, the square became known as Gustaf Adolf's square instead. Saluhallen. 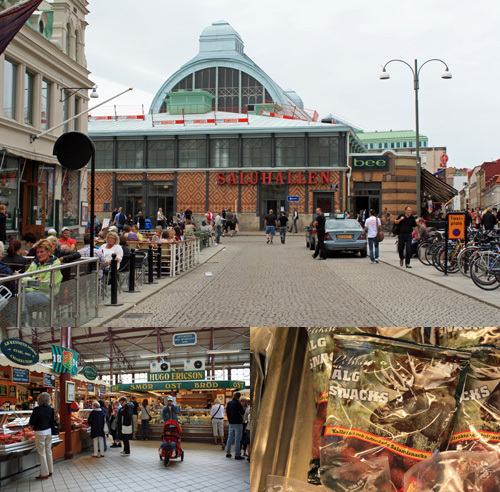 Saluhallen is a covered food market with tons of fresh, fun and unusual foods! Like Moose snacks - Älg snacks (bottom right pic), hehe. Skansen Kronan in Haga, Gothenburg. 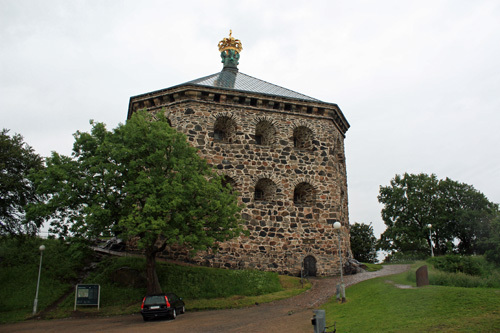 This is an old defence construction built between 1687-1700. 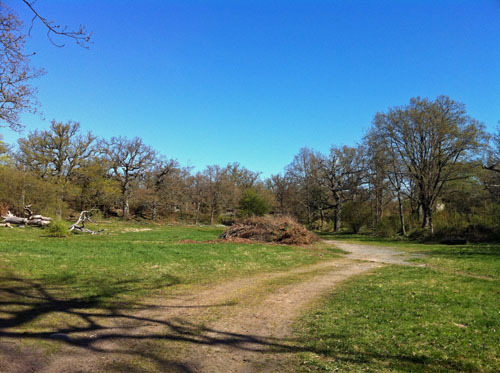 It's located on a small mountain called Risåsberget in Haga, a few kilometres outside Gothenburg. Today this building is used as celebration premises, it's also a great place to enjoy some spectacular views of Gothenburg (for free). 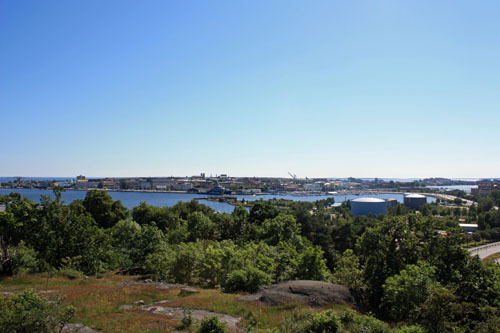 Views from Skansen Kronan in Haga, Gothenburg. I must say it was the best views of the whole day, and it didn't cost a penny. Just a climb up about 195 steep stairs and a small (but also steep) hill, PHEW! I had no idea my fitness level had dropped so dramatically! Yikes! 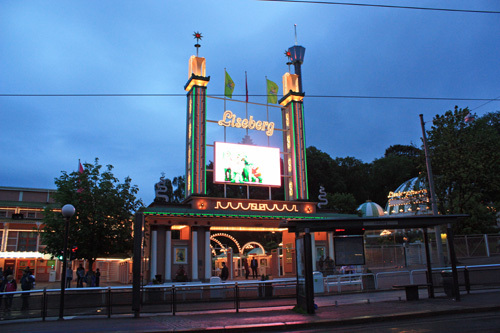 Liseberg amusement park, Gothenburg. We spent Saturday evening at Gothenburgs awesome amusement park Liseberg. I love this one!!! It has been in open since 1923. AtmosFear at Liseberg amusement park. This new attraction is called AtmosFear, ooo! Lol! It's Europe's highest free fall. From 146 meters above sea level you free fall at 110 km/h straight down before the attraction abruptly slows down. 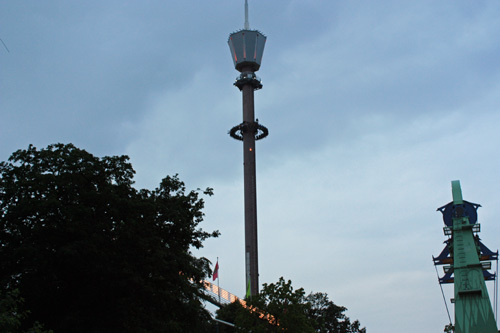 Now I have gone on an attraction like this one called Free Fall at Gröna Lund (amusement park in Stockholm, Sweden). It was probably a few meters shorter but I'm sure my experience would be pretty much the same on AtmosFear - CANNOT BREATHE or see!!! So, nah. I didn't try this one. Hehe. 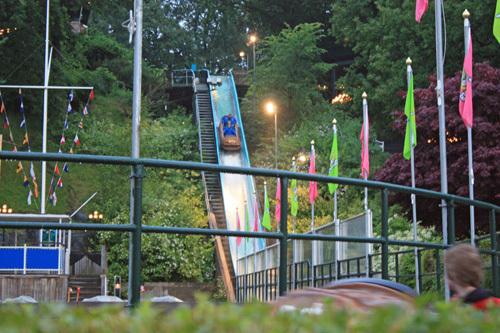 Balder roller coaster at Liseberg amusement park. 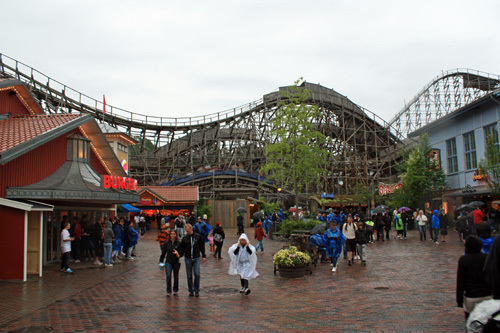 Balder is a roller coaster completely made out of wood. It's also the largest single investment Liseberg has ever made in an attraction so far, which is more than 100 million SEK or 15 099 809 USD. And I did actually ride on this one!!! 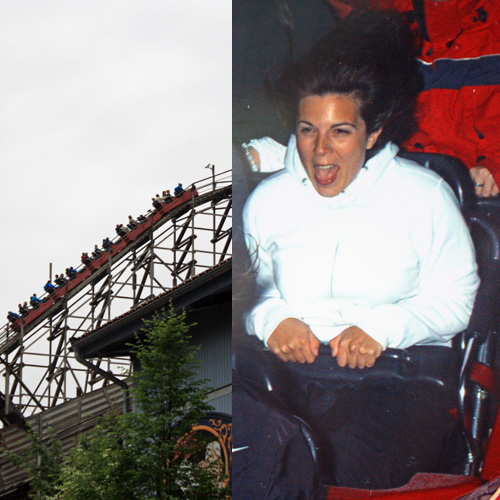 Me on Balder the roller coaster (right pic)!!! Ahhhhhhhhhhh!!!! They had cameras that took photos when we came down one of the steepest hills. LOL! But I must say that the ride wasn't as scary (a good thing) as I thought. I think I probably had raised my expectations of what it would be like (getting slammed from side to side, not being able to breathe, being pushed down in the seat by gravitation) a biiiiiit to much. So it was a very, very, fun ride on da roller coaster for me! 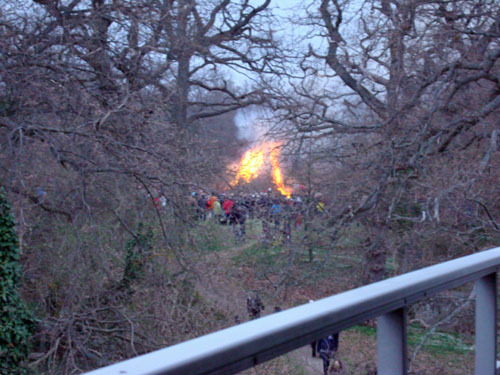 Unfortunately this year all bonfires in the Karlskrona area (which includes Lyckeby) are cancelled. And this is because the ground is so dry right now. Actually, I can't even remember the last time it rained... But I'm not complaining. I love this amazing weather, even though it means no bonfire on Walpurgis Eve for me this year. So this is the view from my balcony of last years bonfire in Ekebacken, Lyckeby. And this is this years bonfire collection in Ekebacken (pic from this morning). Which will remain unlit a while longer. Originally this was a German tradition. Germans believed that witches had witches' sabbath on Walpurgis Night and therefore they used to lit bonfires to keep witches away. But fires were also lit to chase away predators and supernatural beings before animals were placed on pasture for the first time. People around the fires enhanced their intentions by beating on drums, rattling pot lids, screaming and shouting. 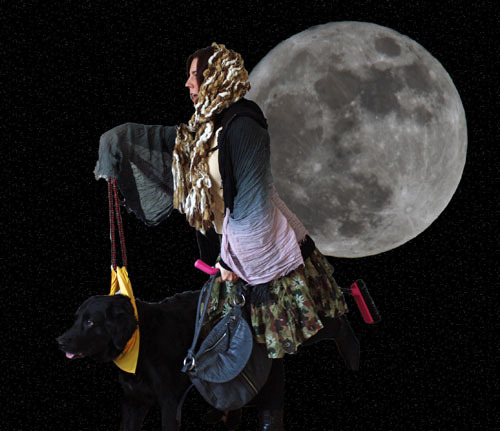 It was during the 1800s the custom to celebrate Walpurgis night started to spread through Sweden. And the name Valborgsmässoafton - Walpurgis Eve originates from Saint Valborg (Walpurgis), who has name day on May 1st. She was an Anglo-Saxon prince's daughter who did missionary work in Germany in the 700's, where she eventually became an abbess. 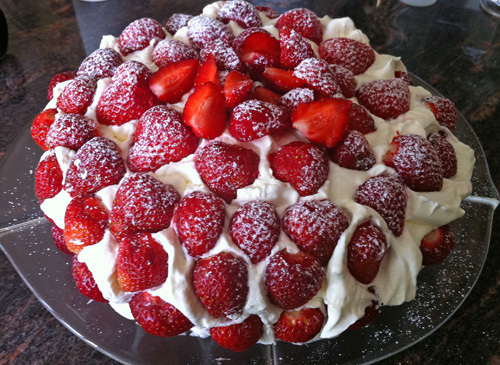 Tomorrow is Maundy Thursday - Skärtorsdagen in Sweden. On this day many children dress up like Easter witches - påskkärringar and knock on doors for candy. 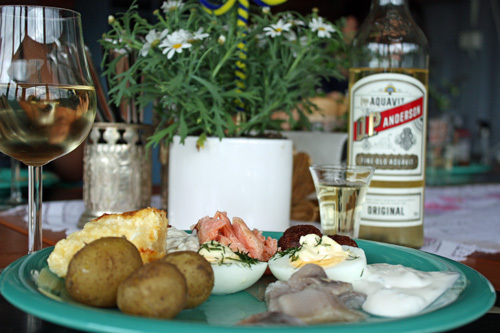 Although it's uncertain when this particular Easter tradition began in Sweden, the practice was widespread in western Sweden in the mid-1800s. The origin of this tradition lies in the 1600's belief in witches and witch trips to the Brocken - Blåkulla. It was believed that all witches flew off to the Brocken on their brooms to socialize with the devil on Maundy Thursday. And it was because this trip took place around Easter that the witches often were referred to as Easter witches. Even though we celebrate Maundy Thursday in a playful manner today, there is no doubt that the history behind this tradition also has a dark side. Because it was during the 1600's witch trials flared up across Europe, due to the fear of witches. And in Sweden it was during the 1660's and 1670's that the witch trials were at their worst. In fact the Swedish name for this day - Skärtorsdagen, comes from the verb cut - skär in the sense of clean - rena, meaning forgiveness of sin days. - The capital of Sweden is Stockholm. - Form of government in Sweden is constitutional monarchy and parliamentary democracy. 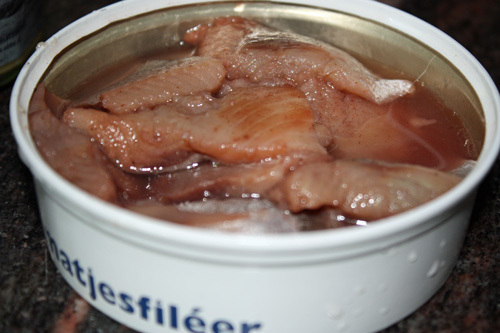 - The population of Sweden in 2010 was approximately 9.3 million. 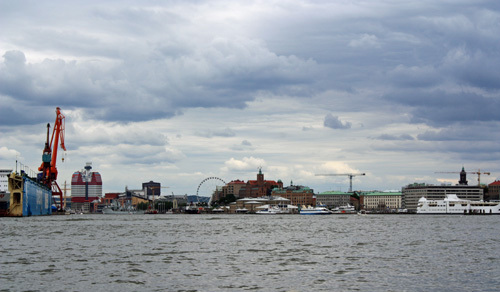 - Sweden is one of the countries with the highest average life expectancy in the world. In 2010 the average life expectancy was; for men 79.1 years and women 83.2 years. - Sweden has the highest number of McDonald's restaurants per person in Europe. Melodifestivalen - Swedish song contest. The singer who wins this contest represents Sweden in the Eurovision Song Contest. Donald Duck "From All of Us to All of You". This cartoon first aired on Christmas Eve in Sweden 1960. And it has continually been one of the most watched TV-shows every year since then. - Sweden hosted the Summer Olympics in 1912 and FIFA World Cup in 1958. The pacemaker - invented in 1958 by Rune Elmqvist. The three-point seat belt - invented in 1959 by Nils Bohlin. Tetra-Pak - invented in 1951 by Erik Wallenberg and his team. The zipper - invented in 1913 by Gideon Sundbäck. Dynamite - invented in 1866 by Alfred Nobel, who also instituted the Nobel Prizes.